WHEN a bike, within minutes of its 1978 launch, acquires the tag " Plastic Maggot " , it’s safe to assume the machine has been less than well received by the masses. But the original CX overcame this cruel jibe to become one of the mainstays of the flourishing motorcycle despatch business. Once Honda had seen its pride and joy welcomed back into the fold of grudging popularity, it decided to make the most of this reprieve and build as many variations on the CX theme as it possibly could. By this token, we were asked to enjoy a CX650 Eurosport (which had nothing to do with either Europe or sport) and then this, the CX500 Custom, which Honda ambitiously christened Silver Wing. 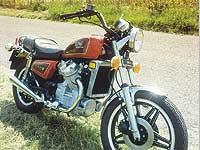 The reasoning was simple; we are Honda, we have a big motorcycle called a GoldWing, which people seemed to like. Therefore, if we introduce something a little smaller called a Silver Wing people will like it also. The logic was irrefutable, but sadly for bike makers, the motorcycle market has never functioned entirely along logical lines.